Last week I started blogging about elements of an infographic created by InkHouse Media + Marketing, examining the ever-evolving role of public relations. While much of the “that was then is now” approach is spot-on – – especially the last part – – it is important to note that we don’t live in a world of black and white. There are few absolutes, but many shades of grey. At first blush this may seem like a no-brainer (some would a strength of mine). Not the case. For some reason, the analogy of a hand-written thank you note comes to mind. The note will most likely have more of an impact on the recipient. It is more thoughtful. Who is the spokesperson? Is it a CEO who is charismatic who rarely has face-time with reporters? What is the topic? Is the topic sensitive in nature that a face-to-face is appropriate? Are you introducing something – a product, solution, idea – that warrants more of a hands-on approach? Can you piggy-back the media tour off of an existing trip? If you do, make sure your spokesperson makes the time specifically for media interviews. Call – whenever possible – from a landline. Marginal cell phone service is an unnecessary distraction. If you are using a cell phone, be in an area with good reception. No speaker phone. The reporter should think you are 100 percent engaged in the interview. Quiet area. Again, distractions are bad. Don’t do an interview while driving. Not smart or safe. Have your notes/key messages in front of you. See driving bullet. Now more than ever, PR professionals need to be buttoned-up. Deadlines are real-time and “citizen reporters” are just 140 characters away. Crisis communication plans need to be fluid and reputation management 24 hours a day. From a proactive media relations standpoint it remains the same as it always has – – what outlet is most appropriate/relevant for the compelling message or story. The outlet of choice may change but the idea of making sure you are getting the right message to the right outlet remains intact. In many ways, social media is the vehicle. The content used in social media will be the driver of influence and that content is going to consist of owned and earned media. Owned media is the content you develop and post on your blogs, Facebook pages, Twitter feeds, etc. You are in total control of your messages and the messages should be more about your real audience seeing you as a trusted source of a particular field/industry, and less about hitting your real audience over the head with your latest product or solution. Earned media is the use of the “fourth estate” – – news outlets that cover/mention you in an article or segment. Positive coverage carries the benefit of third-party credibility. “It isn’t me saying this is great, it is your trusted news source.” Whenever possible/appropriate, earned media can and should be used on your blogs, Facebook pages, etc. The infographic goes into other comparisons but the most important part about the evolution of PR is in the last part of the infographic. 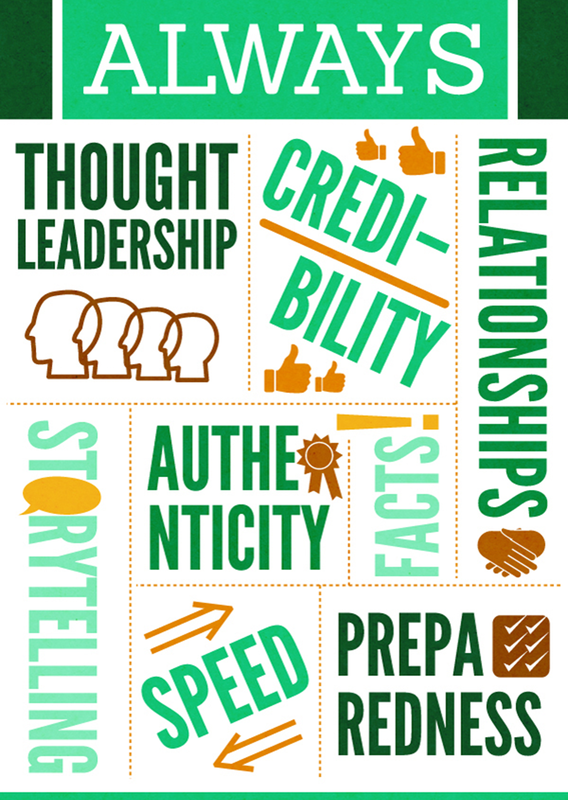 No matter how we – as PR professionals – get there, these elements (listed above) will ALWAYS be the most critical. We are the voice of reason, the conscience and the face of our clients. We are gatekeepers and problem-solvers. Time and technology aren’t going to change that.